Empathy Uganda is a women's group devoted to increasing the social and economic opportunities of women. 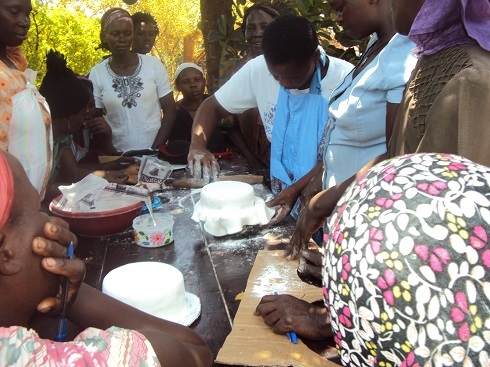 The project funded nine pregnant women to be trained in baking. The women were required to attend an ante and post-natal care clinic and to follow the advice of health care professionals. Some of the funds were spent on building an oven for the women to use in baking. The project beneficiaries appreciated the medical care information and started their baking a few months after delivery of their children. The new income is very welcomed by the group. The project in Uganda is a banana and pineapple cultivation farm that provides income for women. The mini-grant provided materials for ten women to start growing the trees. Empathy Uganda provided training on cultivation, harvesting and marketing for these women. The first harvest was a success and the women have started earning income from selling the fruit.